Details WARNING! CONTAINS LEAD. Please read the MSDS for more information. Chrome Yellow Primrose is a chromate of lead, and is similar to the lead salt PbCrO4 that occurs naturally as the mineral crocoite. It is obtained synthetically as a yellow crystalline powder by precipitation from a solution of a lead salt (such as lead nitrate) and sodium chromate or sodium dichromate, and is used as a pigment either alone or in admixture with other compounds. Synthetic chrome yellow pigments are among several bright pigments with good hiding power that vary from light greenish yellow to reddish medium yellow, consisting essentially of normal lead chromate usually without extenders (such as barite or clay) but often other lead compounds (such as lead sulfate) for the lighter shades, such as primrose. Chromium was discovered as a Siberian mineral, called crocoite in the 18th century. The mineral is deep orange, a natural form of lead chromate. It was analyzed in the late 1790s by the eminent French chemist Nicolas Louis Vauquelin, who identified the new element chromium as the source of the color. Vauquelin studied the compounds of chromium, and found that he could make bright yellow and rich orange versions of lead chromate, both of which he proposed as potential pigments. The chromium colors did not become widespread, however, until the discovery of chromium-containing mineral deposits in France, USA and Britain. The name "chrome yellow" comes from the name of the chemical element from which comes the pigments, chrome, and is derived from the Greek word "chrōma" (χρωμα), meaning color, because many of its compounds are intensely colored. Crocoite was used as a pigment, and after the discovery that the mineral chromite also contains chromium this latter mineral was used to produce pigments as well. The preparation of lead chromates, specifically chrome yellow, was published by Vauquelin in the Annales de Chimie IXX in 1809. The chrome colors were in use by 1816 but on a limited basis. Because the pigment tends to oxidize and darken on exposure to air over time, and it contains lead, a toxic, heavy metal, it has been largely replaced by another pigment, cadmium yellow. Their excellent hiding power and low cost made them a welcomed alternative to Turner's Patent yellow and orpiment. Chrome yellow cost one shilling per watercolor cake in 1835. Chrome pigments were fast drying in oil and more permanent in oil than in watercolor. By 1809, when Vanquelin published his full investigation of the color chemistry of chromium in the Annales de Chimie, chrome yellow already appeared on the artists' palette. One of the earliest appearances of the synthetic pigment was, for example, in Thomas Lawrence's Portrait of a Gentleman, painted in 1810. Lead chromate is prepared by precipitation of neutral solutions of lead salts with chromate or bichromate solutions. The primrose variety of chrome yellow also contains lead sulfate, the method of precipitation remaining largely unchanged since the early 19th century. (See United States Patent 2,023,928, filed on October 10, 1932.) In the 1960s and 1970s, several patents were issued that describe a new method of producing lead chromate pigments that reinforced or encapsulated them in silicate to increase their lightfastness and resistance to chemicals. (See for example, United States Patent 3,370,971, issued on February 27, 1968.) The encapuslated pigment contains about 22% of silica present as a continuous film of dense amorphous silica surrounding the individual particles of the lead chromate derivatives. When dispersed in paint and exposed to light, the pigment containing silica is highly resistant to darkening whereas the untreated product darkens seriously under the same conditions. 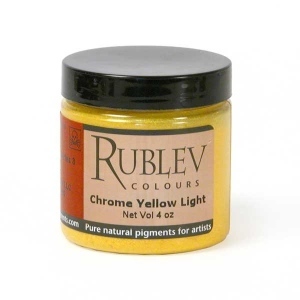 The silicate-coated chrome yellow pigment is the type offered by Natural Pigments. 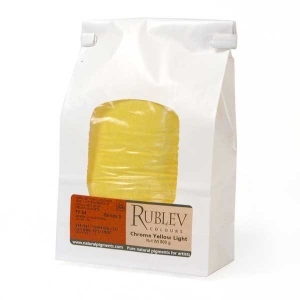 Chrome yellow tends to fade when exposed to sunlight. The darker shades were known to darken over time. All chrome colors were blackened by sulfur-bearing air and the yellow variety sometimes would turn green when mixed with organic pigments. Because the pigment tends to oxidize and darken on exposure to air over time, and it contains lead, a toxic, heavy metal, it has been replaced by cadmium yellow on the artists' palette. Chrome pigments exhibit fair to good acid resistance poor to fair alkali resistance and poor compatibility with sulfide compounds. Encapsulated or reinforced chrome pigments do not suffer the ill effects of the plain variety. They exhibit excellent lightfastness in sunlight, especially in oil and alkyd paints, and excellent heat stability. They also exhibit excellent chemical resistance to acids (2% sulfuric acid solution) and alkalis (1% sodium hydroxide solution). Chrome yellow absorbs a low amount of oil. The oil absorption rate is 19 parts by weight of raw linseed oil to 100 parts by weight of pigment. If the measurement were grams, chrome yellow would require 19 grams of linseed oil to grind 100 grams of pigment to form a stiff paste. Encapsulated chrome yellow pigments have a higher absorption rate of 27 to 33 grams of raw linseed oil to 100 grams of pigment. Chrome pigments are fast drying in oil and combine easily with both oil and water-based paint. Chrome yellow is considered toxic, because it contains lead compounds. Care should be used in handling the dry powder pigment to avoid inhaling or ingesting the dust.